← Calculating the Distance Between Meridians of Longitude Along a Parallel of Latitude. The Celestial Sphere is an imaginary sphere with the Earth located at its centre. We imagine that the ‘celestial bodies’ such as the Sun, Moon, stars and planets are placed on the inner surface of the celestial sphere just as we would see them in the sky. Ecliptic. Although it is the Earth that orbits the Sun, it appears to us that the Sun moves around the celestial sphere taking one year to complete a revolution. This apparent movement of the Sun is called the Ecliptic. Earth’s Rotation. It takes exactly 24 hours for the Earth to turn once on its axis with respect to the Sun but it takes 23 hours, 56 minutes and 4 seconds to complete one rotation with respect to the rest of the universe. The amount of time it takes for the Earth to turn on its axis with respect to the universe is know as the sidereal day and the time taken with respect to the Sun is called a solar day. Ecliptic Poles. If we imagine a line taken from the centre of the Earth to the Sun, it will be at right angles to the path of the ecliptic and where this line meets the celestial sphere will mark the north and south ecliptic poles. Celestial Poles. These are the points where the Earth’s axis of rotation meets the celestial sphere. Geographic Poles. These are the points where the Earth’s axis of rotation meets the Earth’s surface. These are simply known as the North Pole and the South Pole. True North. The direction from a position on the Earth’s surface towards the Geographic North Pole is known as True North. Magnetic Poles. These are the north and south poles of the Earth’s magnetic field and are offset slightly from the geographical poles. Magnetic North. The direction from a position on the Earth’s surface towards the Magnetic North Pole is known as Magnetic North. Deviation. The difference between magnetic north and true north is known as deviation. Axial Tilt. The Earth’s axis is not in line with the Ecliptic Poles but is offset at an angle of 23.4°. In other words, axial tilt is the angle between the geographic/true north pole and the ecliptic north pole measured from the Earth’s centre. The Earth’s Equator is an imaginary line on the Earth’s surface the plane of which is at right angles to the axis of rotation. It is equidistant from the North and South Poles and divides the Earth into the Northern Hemisphere and Southern Hemisphere. The Celestial Equator is the projection of the Earth’s equator onto the surface of the celestial sphere. The tropic of Cancer. This is where the Sun’s declination reaches its northernmost latitude of 23.4oN. The tropic of Capricorn. This is where the Sun’s declination reaches its southernmost latitude of 23.4oS. The Equinoxes. The Sun crosses the celestial equator on two occasions during the course of a year and these occasions are known as the equinoxes. Because the Sun is on the celestial equator at the equinoxes, its declination is of course 0o. The Autumnal Equinox occurs on about the 22nd. September when the Sun crosses the celestial equator as it moves southwards. The Vernal Equinox occurs on about the 20th.March when the Sun crosses the celestial equator as it moves northwards. The Solstices. The times when the Sun reaches the northerly and southerly limits of its path along the ecliptic are known as the solstices. The Summer Solstice (mid-summer in the northern hemisphere) occurs on about 21st. June when the Sun’s declination reaches 23.4o North (the tropic of Cancer). The Winter Solstice (mid-winter in the northern hemisphere) occurs on about 21st. December when the Sun’s declination is 23.4o South (the tropic of Capricorn). Just as the Greenwich meridian has been arbitrarily chosen as the zero point for measuring longitude on the surface of the Earth, the first point of Aries has been chosen as the zero point in the celestial sphere. 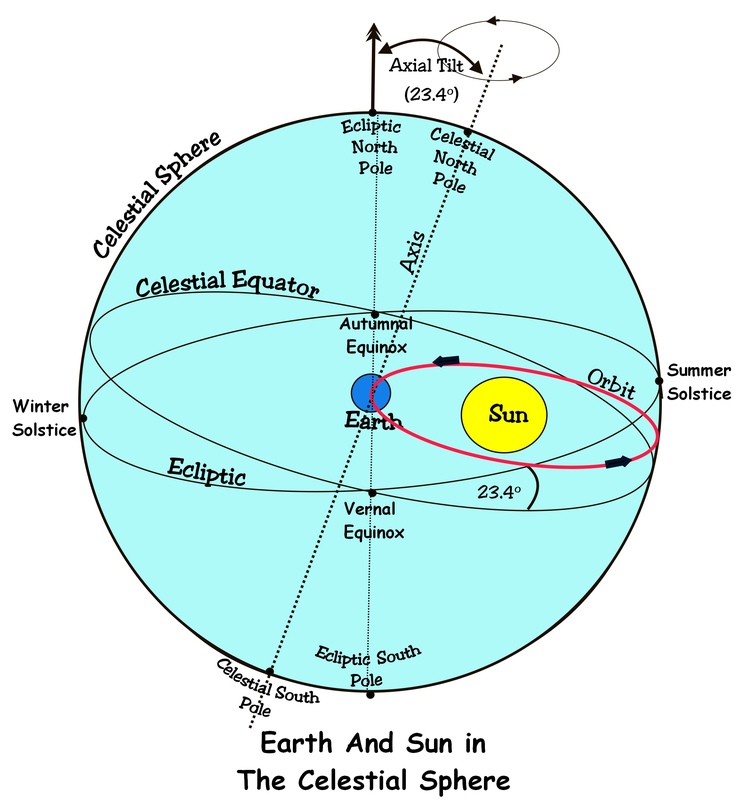 It is the point at which the Sun crosses the celestial equator moving from south to north along the ecliptic (at the vernal Equinox in other words). Right Ascension (RA). 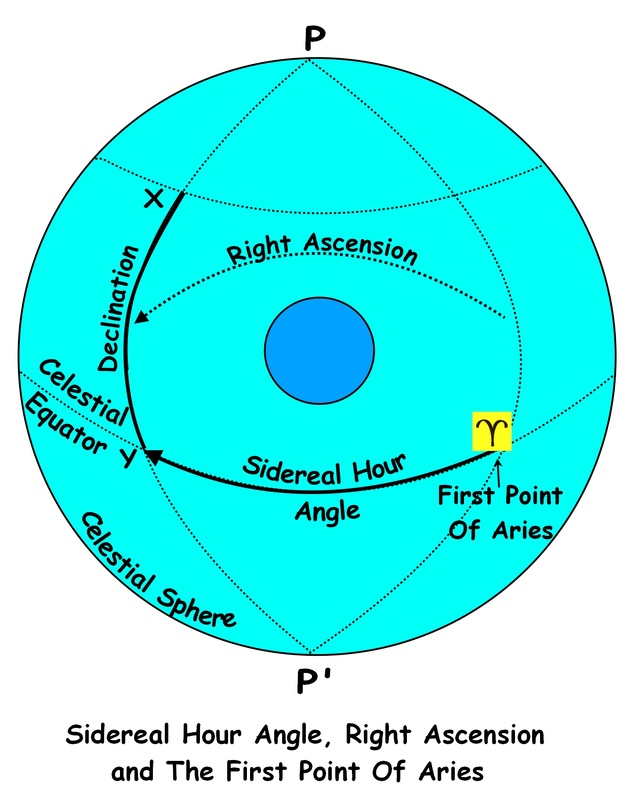 This is used by astronomers to define the position of a celestial body and is defined as the angle between the meridian of the First Point of Aries and the meridian of the celestial body measured in an Easterly direction from Aries. Sidereal Hour Angle (SHA). This is similar to RA in as much that it is defined as the angle between the meridian of the First Point of Aries and the meridian of the celestial body. However, the difference is that SHA is measured westwards from Aries while RA is measured eastwards. PXP’ is the meridian of the celestial body. Y is the point at which the body’s meridian crosses the celestial equator. Note. Units of this course will be issued weekly. This entry was posted in astro navigation, astronomy, celestial navigation, celestial sphere, navigation and tagged astro navigation, astro navigation course, astronomy, celestial navigation, celestial navigation training. Bookmark the permalink.